Federal Tax Forms: Which one should you use? Who Should File a 2017 Tax Return? If you do not receive your Form W-2, contact your employer to find out if and when the W-2 was mailed. If it was mailed, it may have been returned to your employer because of an incorrect address. After contacting your employer, allow a reasonable amount of time for your employer to resend or to issue the W-2. If you received certain types of income, you may receive a Form 1099 in addition to or instead of a W-2. Payers have until January 31 to mail these to you. In some cases, you may obtain the information that would be on the Form 1099 from other sources. For example, your bank may put a summary of the interest paid during the year on the December or January statement for your savings or checking account. Or it may make the interest figure available through its customer service line or Web site. Some payers include cumulative figures for the year with their quarterly dividend statements. You do not have to wait for Form 1099 to arrive provided you have the information (actual not estimated) you need to complete your tax return. You generally do not attach a 1099 series form to your return, except when you receive a Form 1099-R, Distributions From Pensions, Annuities, Retirement or Profit-Sharing Plans, IRAs, Insurance Contracts, etc., that shows income tax withheld. You should, however, keep all of the 1099 forms you receive for your records. your name and address, including zip code, Social Security number, and telephone number. If you misplaced your W-2, contact your employer. Your employer can replace the lost form with a “reissued statement.” Be aware that your employer is allowed to charge you a fee for providing you with a new W-2. You still must file your tax return on time even if you do not receive your Form W-2. If you cannot get a W-2 by the tax filing deadline, you may use Form 4852, Substitute for Form W-2, Wage and Tax Statement, but it will delay any refund due while the information is verified. If you receive a corrected W-2 or 1099 after your return is filed and the information it contains does not match the income or withheld tax that you reported on your return, you must file an amended return on Form 1040X, Amended U.S. Individual Income Tax Return. Most taxpayers will receive one or more forms relating to health care coverage they had during the previous year. If you think you should have received a form but did not get one contact the issuer of the form (the Marketplace, your coverage provider or your employer). If you are expecting to receive a Form 1095-A, you should wait to file your 2017 income tax return until you receive that form. However, it is not necessary to wait for Forms 1095-B or 1095-C in order to file. Form 1095-A. If you enrolled in 2017 coverage through the Health Insurance Marketplace, you should receive Form 1095-A, Health Insurance Marketplace Statement in early 2018. Forms 1095-B or 1095-C. If you were enrolled in other health coverage for 2017, you should receive a Form 1095-B, Health Coverage, or Form 1095-C, Employer-Provided Health insurance Offer and Coverage by early March. If you have questions about your Forms W-2 or 1099 or any other tax-related materials, don’t hesitate to contact the office. Earlier is better when it comes to working on your taxes but many people find preparing their tax return to be stressful and frustrating. Fortunately, it doesn’t have to be. Here are six tips for a stress-free tax season. Don’t Procrastinate. Resist the temptation to put off your taxes until the very last minute. Your haste to meet the filing deadline may cause you to overlook potential sources of tax savings and will likely increase your risk of making an error. Getting a head start will not only keep the process calm but also mean you get your return faster by avoiding the last-minute rush. Gather your records in advance. Make sure you have all the records you need, including W-2s and 1099s. Don’t forget to save a copy for your files. Double-check your math and verify all Social Security numbers. These are among the most common errors found on tax returns. Taking care will reduce your chance of hearing from the IRS. Submitting an error-free return will also speed up your refund. E-file for a faster refund. Taxpayers who e-file and choose direct deposit for their refunds, for example, will get their refunds in as few as 10 days. That compares to approximately six weeks for people who file a paper return and get a traditional paper check. Don’t Panic if You Can’t Pay. If you can’t immediately pay the taxes you owe, consider some stress-reducing alternatives. You can apply for an IRS installment agreement, suggesting your own monthly payment amount and due date, and getting a reduced late payment penalty rate. You also have various options for charging your balance on a credit card. There is no IRS fee for credit card payments, but the processing companies charge a convenience fee. Electronic filers with a balance due can file early and authorize the government’s financial agent to take the money directly from their checking or savings account on the April due date, with no fee. Request an Extension of Time to File (But Pay on Time). If the clock runs out, you can get an automatic six-month extension bringing the filing date to October 15, 2018. However, the extension itself does not give you more time to pay any taxes due. You will owe interest on any amount not paid by the April deadline, plus a late payment penalty if you have not paid at least 90 percent of your total tax by that date. If you run into any problems, have any questions, or need to file an extension, help is just a phone call away. If you donated a car to a qualified charitable organization in 2017 and intend to claim a deduction, you should be aware of the special rules that apply to vehicle donations. Note: You can deduct contributions to a charity only if you itemize deductions using Schedule A of Form 1040. Charities typically sell donated vehicles. If the vehicle is sold by the charitable organization you donated it to, the deduction claimed by the donor (you) and usually may not exceed the gross proceeds from the sale. If the donated vehicle sells for less than $500, you can claim the fair market value of your vehicle up to $500 or the amount it is sold for if less than fair market value. The charitable organization makes a significant intervening use of the vehicle, such as using it to deliver meals on wheels. The charitable organization donates or sells the vehicle to a needy individual at a significantly below-market price, if the transfer furthers the charitable purpose of helping a poor person in need of a means of transportation. The charitable organization makes a material improvement to the vehicle, i.e., major repairs that significantly increase its value and not mere painting or cleaning. If the donated vehicle sells for more than $500 and your deduction is $500 or more you must obtain written, contemporaneous (timely), acknowledgment of the donation from the charitable organization. You must also attach Form 1098-C, Contributions of Motor Vehicles, Boats, and Airplanes, to your tax return. a statement that goods or services provided by the charity consisted entirely of intangible religious benefits, if that was the case. Note: If the written acknowledgment does not contain all of the required information, the deduction may not exceed $500. For more information about donating a car to charity please contact the office. U.S. citizens and resident aliens use one of three different forms for filing individual federal income tax returns: 1040EZ, 1040A, or 1040. If you’re wondering which form you should use, keep reading. Note: You can’t use Form 1040EZ to claim the Premium Tax Credit. You also can’t use this form if you received advance payments of this credit in 2017. You do not have an alternative minimum tax adjustment on stock you acquired from the exercise of an incentive stock option. Your taxable income is $100,000 or more. You itemize deductions or claim certain tax credits or adjustments to income. You report income from sale of a property. Nonresident aliens married to a U.S. citizen or resident alien may use any one of these three forms, based on your circumstances, but only if you elect to be treated as a resident alien when you file a joint return with your spouse. Nonresident aliens may have to file Form 1040NR-EZ or Form 1040NR. Questions about federal tax forms? Call or make an appointment today and get the answers you need right now. Recent tax reform legislation affected many provisions in the tax code. Many were modified, either permanently or temporarily, while some were repealed entirely. Here are five that survived. While the House bill repealed the mortgage interest deduction, the final version of the act retained it, albeit with modifications. First is that the allowed interest deduction is limited to mortgage principal of $750,000 on new homes (i.e., new ownership). For prior tax years, the limit on acquisition indebtedness was $1 million. Existing mortgages are grandfathered in, however, and taxpayers who enter into binding contracts before December 15, 2017, to close on the purchase of a principal residence before January 1, 2018, and who purchase such residence before April 1, 2018, are able to use the prior limit of $1 million. In prior years, taxpayers who itemize were allowed to deduct the amount they pay in state and local taxes (SALT) from their federal tax returns. Slated for repeal (with the sole exception of exception of a state and local property tax deduction capped at $10,000) under both the House and Senate versions of the tax bill, SALT remained in the final tax reform bill in modified form. As such, for taxable years 2018 through 2025, the aggregate deduction for property taxes, state, local, and foreign income taxes, or sales taxes is limited to $10,000 a year ($5,000 married filing separately). Primary and secondary school teachers buying school supplies out-of-pocket are still able to take an above-the-line deduction of up to $250 for unreimbursed expenses. Expenses incurred for professional development are also eligible. This deduction was made permanent with the passage of PATH Act of 2015 and survived tax reform legislation that passed in 2017 as well. Also slated for elimination in the House bill (but retained in the final tax reform bill) was the tax credit for the purchase of qualified plug-in electric drive motor vehicles including passenger vehicles and light trucks. For vehicles acquired after December 31, 2009, the minimum credit is $2,500. The maximum credit allowed is limited to $7,500. The credit begins to phase out for a manufacturer’s vehicles when at least 200,000 qualifying vehicles have been sold for use in the United States (determined on a cumulative basis for sales after December 31, 2009). The House version proposed a repeal of the itemized deduction related to medical expenses but it was retained (and temporarily lowered) in the final tax reform legislation. For tax years 2017 and 2018, the threshold amount for medical expense deductions is reduced to 7.5 percent of AGI. Under the PATH Act of 2015, the medical expense deduction increased to 10% of AGI (effective for tax years 2013 to 2016). If you’re wondering whether you should be taking advantage of these and other tax credits and deductions, don’t hesitate to call. More than 155 million individual tax returns are expected to be filed in 2018, according to the IRS, which began accepting electronic and paper tax returns on Monday, January 29, 2018. The January 29 opening date was set to ensure the security and readiness of key tax processing systems in advance of the opening and to assess the potential impact of tax legislation on 2017 tax returns. Note: Although the IRS began accepting both electronic and paper tax returns January 29, paper returns will not begin processing until mid-February as system updates continue. The filing deadline to submit 2017 tax returns is Tuesday, April 17, 2018, rather than the traditional April 15 date. In 2018, April 15 falls on a Sunday, and this would usually move the filing deadline to the following Monday (April 16). However, Emancipation Day, which is a legal holiday in the District of Columbia, will be observed on that Monday. This pushes the nation’s filing deadline to Tuesday, April 17, 2018. Under the tax law, legal holidays in the District of Columbia affect the filing deadline across the nation. The IRS anticipates issuing more than nine out of 10 refunds in less than 21 days, but there are some important factors to keep in mind. The IRS will begin releasing refunds for taxpayers claiming the Earned Income Tax Credit (EITC) and the Additional Child Tax Credit (ACTC) starting February 15. However, these refunds–even the portion not associated with the EITC and ACTC–are not likely to arrive in bank accounts or on debit cards until the week of February 27. This date assumes that there are no processing issues with the tax return and the taxpayer chose direct deposit. Taxpayers should be aware that many financial institutions do not process payments on weekends or holidays, which can affect when refunds reach taxpayers. For example, the three-day holiday weekend involving Presidents’ Day may affect the timing of refunds for EITC and ACTC filers. Don’t hesitate to call if you have any questions or need assistance filing your tax return this year. Most people file a tax return because they have to, but even if you don’t, there are times when you should–because you might be eligible for a tax refund and not know it. The six tax tips below should help you determine whether you’re one of them. 1. General Filing Rules. Whether you need to file a tax return this year depends on several factors. In most cases, the amount of your income, your filing status, and your age determine whether you must file a tax return. For example, if you’re single and 28 years old you must file if your income, was at least $10,400 ($20,800 if you are married filing a joint return). If you’re self-employed or if you’re a dependent of another person, other tax rules may apply. 2. Premium Tax Credit. If you purchased coverage from the Marketplace in 2017 you might be eligible for the Premium Tax Credit if you chose to have advance payments of the premium tax credit sent directly to your insurer during the year; however, you must file a federal tax return and reconcile any advance payments with the allowable premium tax credit. 3. Tax Withheld or Paid. Did your employer withhold federal income tax from your pay? Did you make estimated tax payments? Did you overpay last year and have it applied to this year’s tax? If you answered “yes” to any of these questions, you could be due a refund, but you have to file a tax return to receive the refund. 4. Earned Income Tax Credit. Did you work and earn less than $53,930 last year? You could receive EITC as a tax refund if you qualify with or without a qualifying child. You may be eligible for up to $6,318. If you qualify, file a tax return to claim it. 5. Additional Child Tax Credit. Do you have at least one child that qualifies for the Child Tax Credit? If you don’t get the full credit amount, you may qualify for the Additional Child Tax Credit and receive a refund even if you do not owe any tax. 6. American Opportunity Credit. The AOTC (up to $2,500 per eligible student) is available for four years of post-secondary education. You or your dependent must have been a student enrolled at least half-time for at least one academic period. Even if you don’t owe any taxes, you still may qualify; however, you must complete Form 8863, Education Credits, and file a return to claim the credit. If you have any questions about whether you should file a return, please contact the office. Updated income-tax withholding tables have been released for 2018 reflecting changes made by the tax reform legislation enacted last month. The updated withholding information, available on IRS.gov, shows the new rates for employers to use during 2018. Employers should begin using the 2018 withholding tables as soon as possible, but not later than February 15, 2018. They should continue to use the 2017 withholding tables until implementing the 2018 withholding tables. Many employees will begin to see increases in their paychecks to reflect the new law in February. The time it will take for employees to see the changes in their paychecks will vary depending on how quickly the new tables are implemented by their employers and how often they are paid, generally weekly, biweekly or monthly. To minimize the burden on taxpayers and employers, the new withholding tables are designed to work with the Forms W-4 that workers have already filed with their employers to claim withholding allowances. Employees do not have to do anything at this time. Under the new law there are a number of changes for 2018 that affect individual taxpayers. The new withholding tables reflect the increase in the standard deduction, repeal of personal exemptions and changes in tax rates and brackets. For people with more simple tax situations, the new tables are designed to produce the correct amount of tax withholding. The revisions are also aimed at avoiding over- and under-withholding of tax as much as possible. To help people determine their withholding (and adjust as needed), the IRS is revising the withholding tax calculator on IRS.gov and should be available by the end of February. Don’t hesitate to call if you need help figuring out your withholding in 2018. The Form W-2 scam has emerged as one of the most dangerous phishing emails in the tax community. During the last two tax seasons, cybercriminals tricked payroll personnel or people with access to payroll information into disclosing sensitive information for entire workforces. Last year, more than 200 employers were victimized, resulting in hundreds of thousands of employees with compromised identities. The scam affected all types of employers, from small and large businesses to public schools and universities, hospitals, tribal governments, and charities. Income, social security, or Medicare tax was withheld. Income tax would have been withheld if the employee had claimed no more than one withholding allowance or had not claimed exemption from withholding on Form W-4, Employee’s Withholding Allowance Certificate. The Form W-2 contains the employee’s name, address, Social Security number, income, and withholdings. Criminals use that information to file fraudulent tax returns, or they post it for sale on the DarkNet. Cybercriminals do their homework, identifying chief operating officers, school executives or others in positions of authority. Using a technique known as business email compromise (BEC) or business email spoofing (BES), fraudsters posing as executives send emails to payroll personnel requesting copies of Forms W-2 for all employees. In many cases, the email starts off as a friendly exchange before the fraudster asks for all Form W-2 information. In several reported cases, after the fraudsters acquired the workforce information, they immediately followed that up with a request for a wire transfer. Employers should be aware that cyber criminals’ scams constantly evolve. Finance and payroll personnel should be alert to any unusual requests for employee data. If your businesses or organization falls victim to the scam or receives a suspect email but does not fall victim to the scam send the full email headers to phishing@irs.gov and use “W2 Scam” in the subject line. Starting in February 2018, individuals with “seriously delinquent tax debts” will be subject to a new set of provisions courtesy of the Fixing America’s Surface Transportation (FAST) Act, signed into law in December 2015. The FAST Act requires the IRS to notify the State Department of taxpayers the IRS has certified as owing a seriously delinquent tax debt and also requires the State Department to deny their passport application or deny renewal of their passport. In certain instances, the State Department may revoke their passport. Taxpayers affected by this law are those with a seriously delinquent tax debt, generally, an individual who owes the IRS more than $51,000 in back taxes, penalties and interest for which the IRS has filed a Notice of Federal Tax Lien and the period to challenge it has expired, or the IRS has issued a levy. Having collection suspended because a taxpayer has made an innocent spouse election or requested innocent spouse relief. For taxpayers serving in a combat zone, and who also owe a seriously delinquent tax debt, the IRS postpones notifying the State Department and the individual’s passport is not subject to denial during this time. Taxpayers can request a payment agreement with the IRS by filing Form 9465, Installment Agreement Request. Taxpayers can download this form from IRS.gov and mail it along with a tax return, bill or notice. Some taxpayers may be eligible to use the online payment agreement to set up a monthly payment agreement for up to 72 months. Financially distressed taxpayers may qualify for an offer in compromise, an agreement between a taxpayer and the IRS that settles the taxpayer’s tax liabilities for less than the full amount owed. The IRS looks at the taxpayer’s income and assets to determine the taxpayer’s ability to pay. If you owe back taxes and are worried your passport could be revoked because of unpaid taxes, please contact the office. If you are missing the mark frequently, you won’t be able to get a true picture of your financial status, and your cash flow will suffer. Use QuickBooks’ built-in reminders to avoid this unnecessary drama; here is how they work. Figure 1: When you’re setting up your Preferences for QuickBooks’ Reminders, you can customize each type in multiple ways. As you can see in the above image, QuickBooks lets you create reminders for a wide variety of actions. For each, you can indicate whether the Reminders window will display a summary or a list, or whether that particular activity will not be included. For those that are time-sensitive, like Checks to Print, you will also be able to specify how much warning you will get and how many days in advance each item will appear in the Reminders list. If you haven’t worked much with QuickBooks’ Preferences, you may not understand the difference between the two tabs that appear in each window. 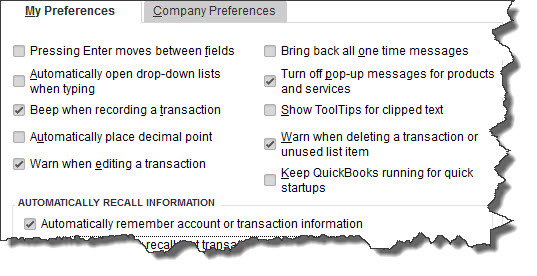 Only the QuickBooks Administrator can make changes on the Company Preferences page since these affect company-wide settings. All users, though, can change any options that appear in the My Preferences window. Figure 2: Open the Edit menu and select Preferences, then General to open this window. Everyone who uses QuickBooks can set up their Preferences here, but only the administrator can modify Company Preferences. If you indicated in My Preferences that you want the Reminders window to open every time you open your company file in QuickBooks, it should appear on top of your desktop. If you didn’t, or if you need to see it after you’ve closed it, open the Company menu and select Reminders. A link should also be available in the toolbar. Using the Reminders tool is like using any other interactive to-do list. Figure 3: QuickBooks’ Reminders window displays the tasks you need to do today and in the near future. You can click the arrows to the left of each boldfaced category to expand or collapse the list. The left pane of the window displays tasks that must be done today, while the right shows upcoming tasks. Small arrows to the left of each task category expand and collapse each section when you click on them. Double-click a task (not the category label), and the relevant form or other document opens. When you’ve completed the chore, it will disappear from the list. There are two icons in the upper right of the window (not pictured here). Click the plus (+)sign, and the Add To Do window opens. You can create six types of to-do items here: call, fax, e-mail, meeting, appointment, and task. Each can be assigned to a customer, vendor, or employee, or earmarked as a lead. You can designate a priority (low, medium, high) and a status (active, inactive, done) to each. You can also assign a time and date due, and enter descriptive details. Each to-do then appears in the appropriate place in QuickBooks. The other icon, a small gear, opens your Preferences for Reminders. The mechanics of setting up your Reminders window are not difficult. What can be a challenge is watching your cash flow as all these transactions occur. If you are struggling with that, please call and ask to meet with a QuickBooks expert who will help you develop a plan for keeping your cash flow positive while meeting your financial obligations. Employees – who work for tips. If you received $20 or more in tips during January, report them to your employer. You can use Form 4070. Employers – Social Security, Medicare, and withheld income tax. File Form 941 for the fourth quarter of 2017. This due date applies only if you deposited the tax for the quarter in full and on time. Farm Employers – File Form 943 to report Social Security and Medicare taxes and withheld income tax for 2017. This due date applies only if you deposited the tax for the year in full and on time. Certain Small Employers – File Form 944 to report Social Security and Medicare taxes and withheld income tax for 2017. This tax due date applies only if you deposited the tax for the year in full and on time. Employers – Nonpayroll taxes. File Form 945 to report income tax withheld for 2017 on all nonpayroll items. This due date applies only if you deposited the tax for the year in full and on time. Employers – Federal unemployment tax. File Form 940 for 2017. This due date applies only if you deposited the tax for the year in full and on time. Employers – Social Security, Medicare, and withheld income tax. If the monthly deposit rule applies, deposit the tax for payments in January. Employers – Nonpayroll withholding. If the monthly deposit rule applies, deposit the tax for payments in January. Businesses – File information returns (Form 1099) for certain payments you made during 2017. These payments are described under January 31; however, Form 1099-MISC reporting nonemployee compensation must be filed by January 31. There are different forms for different types of payments. Use a separate Form 1096 to summarize and transmit the forms for each type of payment. See the 2017 Instructions for Forms 1099, 1098, 5498, and W-2G for information on what payments are covered, how much the payment must be before a return is required, what form to use, and extensions of time to file. If you file Forms 1097, 1098, 1099, 3921, 3922, or W-2G electronically (except Form 1099-MISC reporting nonemployee compensation), your due date for filing them with the IRS will be extended to April 2. The due date for giving the recipient these forms is still January 31. Payers of Gambling Winnings – File Form 1096, Annual Summary and Transmittal of U.S. Information Returns, along with Copy A of all the Forms W-2G you issued for 2017. If you file Forms W-2G electronically, your due date for filing them with the IRS will be extended to April 2. The due date for giving the recipient these forms remains January 31. Large Food and Beverage Establishment Employers – with employees who work for tips. File Form 8027, Employer’s Annual Information Return of Tip Income and Allocated Tips. Use Form 8027-T, Transmittal of Employer’s Annual Information Return of Tip Income and Allocated Tips, to summarize and transmit Forms 8027 if you have more than one establishment. If you file Forms 8027 electronically, your due date for filing them with the IRS will be extended to April 2. Health Coverage Reporting – If you’re an Applicable Large Employer, file paper Forms 1094-C, Transmittal of Employer-Provided Health Insurance Offer and Coverage Information Returns, and 1095-C with the IRS. For all other providers of minimum essential coverage, file paper Forms 1094-B, Transmittal of Health Coverage Information Returns, and 1095-B with the IRS. If you’re filing any of these forms with the IRS electronically, your due date for filing them will be extended to April 2. Farmers and Fishermen – Farmers and fishermen. File your 2017 income tax return (Form 1040) and pay any tax due. However, you have until April 17 to file if you paid your 2017 estimated tax by January 16, 2018. Copyright © 2018 All materials contained in this document are protected by U.S. and international copyright laws. All other trade names, trademarks, registered trademarks and service marks are the property of their respective owners.